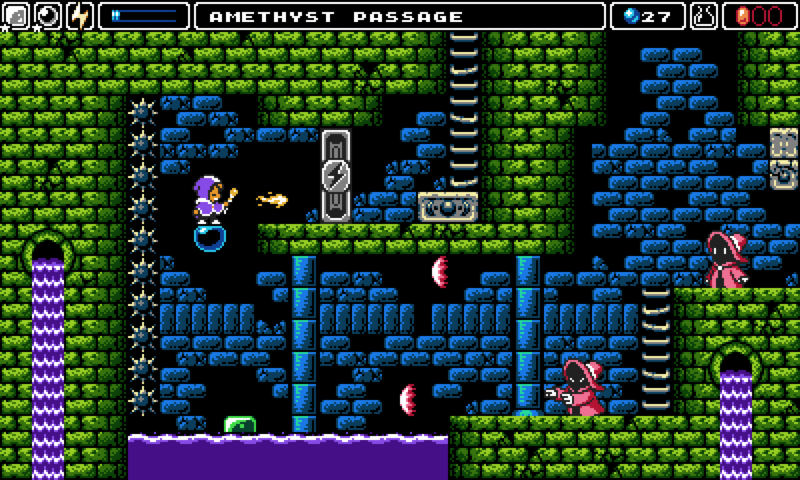 Alwa’s Awakening is an 8-bit throwback game which has many metroidvania inspirations. Developed by Elden Pixels, a small team of four assembled in 2016, this is their first project. This review is based on the Nintendo Switch version. The game opens with a brief explanation of how the beautiful world of Alwa was enslaved by a mystical being named Vicar. He arrived in Alwa driven by hate and directed his four henchmen (named the “Protectors”) to each acquire a powerful ornament to cripple the world and begin his evil reign. Luckily, a heroine from another world named Zoe has been summoned to fight this menace and light the eternal flame to return peace to the land. From the start, you can immediately see and feel how authentically retro this game is. Controls, graphics, and Sounds are all perfectly representative of the NES era of gaming. Only three buttons are assigned for use outside of the D-pad controls: Jump, attack, and select skill. Zoe’s jumps can be modified by a tap or hold of the jump button, with many gaps requiring a careful touch to make it over safely. Basic attacks are made with the magic staff, which is also the catalyst for casting special skills. To use one of these skills, hold up when pressing attack. Skills include: Summoning a green block to act as a stepping stone or shield from enemy attacks, creating a bubble that floats slowly upwards offering a rising platform to reach new heights, and shooting a firebolt from your staff. You must be quick and crafty to solve later puzzles by swapping between abilities to use them in conjunction with one another. Zoe begins her adventure without any equipment, jumping around until she finds the staff. There is adequate direction from there to the first few dungeons, earning Zoe items and powers that will unlock further progression into more difficult areas. The second half of the game was more plodding and unguided; upgrading skills was required to access the final area, and wandering the map to find where all the skill upgrades were tucked away lacked the momentum of the early game experience. However, these adventures help you realize Alwa is filled with secrets. Walls are not often solid, and spikes may sometimes be illusions. The rumble feature is used as a sixth sense to give Zoe hints of where potential oddities occur, which is a fantastic use of newer technology to include obscure secrets that old school games have without being unfair. On top of item and skill acquisition, Zoe must regain each of the four stolen Ornaments from Vicar’s Protectors to access his fortress. These evil minions are each waiting at the end of dungeons filled with devilishly clever puzzles that put your mind and thumbs to the test. Boss fights are demanding and exciting. Skills must be used to avoid and deal damage to Protectors and boss fights in general. Areas leading up to boss encounters are often quite perilous and have very few checkpoints. 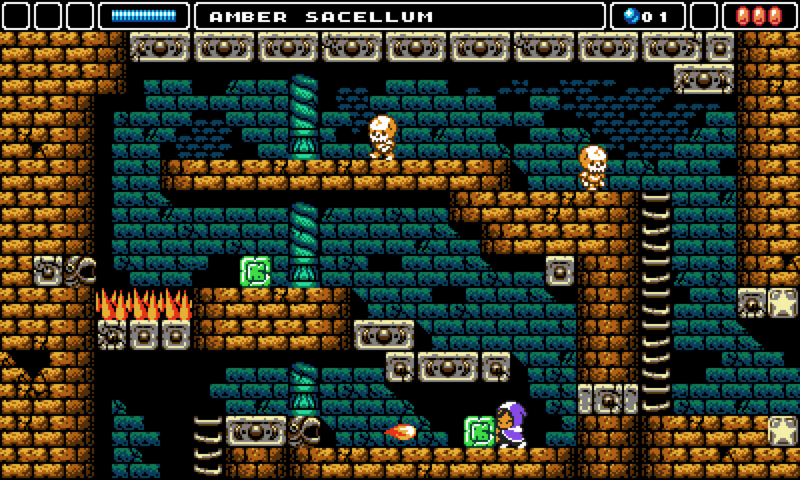 At times, puzzles must be solved while riding moving platforms surrounded by walls of spikes and enemies throwing projectiles. With only three hit points, Zoe must take care. Luckily, there are always checkpoints outside of boss encounters. 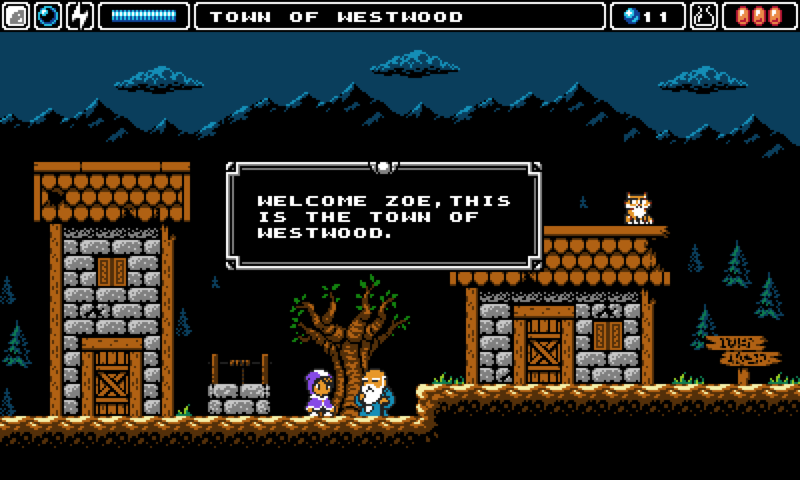 Death in Alwa’s Awakening sets Zoe back to the last checkpoint she activated, keeping any newly acquired items safely in her inventory. You can check your inventory at any time by pausing the game, giving you a quick rundown on which items and skills you have obtained, as well as Zoe’s current location on a map of the explored parts of Alwa. As I came to the end of my time with Alwa’s Awakening, I was impressed by the commitment to its retro style. The chiptune soundtrack is excellently crafted. Each area of the world has a unique vibe, adding to the atmosphere substantially. The minimal colour palette looks great, and is totally reminiscent of the limitations of the old NES hardware. Characters, enemies, bosses, and environments all look like they came straight out of the early 90s. This game offers consistent difficulty while adventuring, and proper challenge during bosses. For anyone looking for a taste of old school adventure, Alwa’s is easy to recommend.